How do I use the Author Link functionality? Learn how to set a default author link and use the per-recipe override. The Default Author Link will be used on all recipe cards, unless a per-recipe override is set. What page should I link to? It is best to link to a page that describes your qualifications for creating the recipes that you create. This may or may not be your general "About" page. If you have a page dedicated to your background with a certain type of cooking or that describes your experience in culinary school you could use that instead of a general About page. However, if this information is prominently and clearly included in your About page then that page would work fine as well. 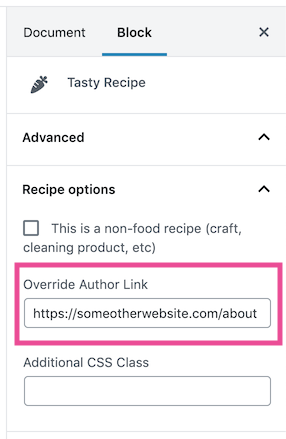 To set the Default Author Link, head over to Settings → Tasty Recipes and enter a full URL into the Default Author Link field. Save the post and that link will be used in that recipe instead of the default.